Flu is a contagious disease that can be passed from one person to another via sneezing, coughing and secretions from the nose. While everyone is susceptible to flu infection, young children, the aging population and people with compromised immune systems have the highest risk of infection and death. While the flu is not 100% preventable, getting the flu vaccination can reduce your risk of infection. The disease causes fever, chills, fatigue, muscle aches, sore throat and, in severe cases, death. The vaccination not only protects you from certain strains of flu, it can protect others by reducing the risk of you passing the disease on to others. Flu vaccinations are offered yearly. There are multiple strains of the flu, so scientists work to predict which strains of the flu will be most prevalent before the start of flu season. These strains are used for the flu injection and nasal vaccination. You need to be vaccinated every year to maintain protection. It takes about two weeks for the vaccination to take effect. Flu shots are formulated with “killed” strains of the flu. These dead strains are injected into the arm. Side effects may include fever, soreness at the injection site, sore throat and fatigue. These symptoms are similar to those that occur when you contract the flu, but flu injections do not include live strains of the flu so you cannot get the flu from a flu vaccination. Seizures associated with high fever have been reported in children who receive the flu vaccination at the same time they receive the pneumococcal vaccine. Talk with your physician if your child is receiving other vaccinations on the same day they receive the flu vaccination. Life-threatening allergies to the flu vaccination are rare, but do exist. The reaction typically occurs within minutes or hours of the flu vaccination. Children or adults with a severe allergy to eggs should not have the flu vaccination. Other life-threatening allergies, including allergies to other foods, should be discussed with your physician before you or your child receives the flu vaccine. Afluria, a brand name flu vaccination, is not approved for children under eight. 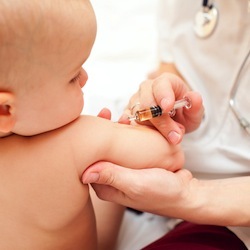 Children six months and older can be vaccinated. Older children, teens and adults are all eligible for the vaccine, with the exception of special medical circumstances. Mild fever and pain can be treated with non-aspirin fever reducer in children, as per physician instructions. High fever or any abnormal reactions can be signs of an allergic reaction. Seek medical attention if you or your child experience trouble breathing, wheezing, hives or increased heart rate.